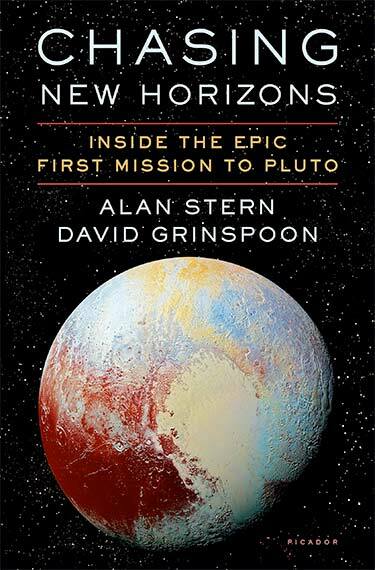 The up close, inside story of the greatest space exploration project of our time, New Horizons’ mission to Pluto, as shared with David Grinspoon by mission leader Alan Stern and other key players. How did this happen? Chasing New Horizons is the story of the men and women behind this amazing mission: of their decades-long commitment and persistence; of the political fights within and outside of NASA; of the sheer human ingenuity it took to design, build, and fly the mission; and of the plans for New Horizons’ next encounter, 1 billion miles past Pluto in 2019. Told from the insider’s perspective of mission leader Dr. Alan Stern and others on New Horizons, Chasing New Horizons is a riveting story of scientific discovery, and of how much we humans can achieve when people focused on a dream work together toward their incredible goal. Alan Stern and David Grinspoon take the reader to Pluto on a historic odyssey from its inception to its conclusion. Stern and Grinspoon show us what NASA can do when the United States brings its best. New Horizons is still flying, and for us Plutophiles it’s the adventure of a lifetime. Thrilling… a future classic of popular science, full of twists and turns and unexpected heroes…with a dramatic and profound payoff. Chasing New Horizons is a cliff-hanger, a page-turner, a spine-tingler, and, ultimately, a reason to stand up and cheer. To Pluto and beyond! This is a thrilling and very human account of one of the greatest scientific adventures of our generation. A compelling account of one of the most ambitious space exploration missions ever conducted. Subscribe to stay informed about Alan's news and upcoming events.